TWO MAGAZINES FOR THE PRICE OF ONE! COME ON IN! 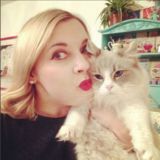 ABOUT ME I’m Steph Durrant, 30, a magazine journalist, and I live with my ragdoll cat, Cece. MY HOME I live in a one-bedroom flat in Chelmsford, Essex, which I bought in February 2014. WHEN I BOUGHT IT It’s a groundfloor flat in a converted 1930s semidetached house. It was just renovated when I moved in and I was the first to live there, so needed to select flooring and put my stamp on the place. AND NOW I didn’t need to do any decorating, but I’ve brightened the place with plenty of colour, using art, furniture, and handmade accessories. STYLE TIP I prefer to keep walls and furniture white, then introduce vibrant pieces that can be swapped about when I get the itch for change. front door off the street, so it didn’t feel like a flat. It also has a quiet, southfacing shared garden and I have my own patio to put a table and chairs and pot plants on. The garden is scarcely used, so it often feels like it’s just mine. When I moved in, the first thing I had to do was pick flooring, which was fine as I knew a little independent shop that had fitted the flooring in my previous house. I chose a cream carpet for the bedroom and the same laminate flooring that was in my old property for the rest of the house, as I liked its rustic look and it was great value. The service was so much more helpful than in bigger chain stores. Buy an MDF letter, from £1, Hobbycraft. Use acrylic paint to colour the edges, and leave to dry. Spread a little PVA onto the letter front and stick on a piece of printed wrapping paper. Smooth and leave face down to dry. With paper face down, cut round the letter with a craft knife. Repeat steps 2 and 3 on the back. Cut out smaller motifs from the wrapping paper and glue onto the front. Finish with layers of PVA. I like using Pinterest to gather ideas and working on interiors magazines, I get the serious ‘I-want’s’ every time a company brings out a new collection. The open-plan kitchen/living space is ideal for when I have friends over and the big patio doors are a treat to have open in summer. It’s such a light space and a cheerful place to be. My first house was styled a little like this one, but now I live alone, I have ramped up the girliness. It’s a little quirky, with plenty of handmade features and my friends say there’s always something new to see each time they come over. It’s often described as ‘very Steph’, but I’m still never sure if that’s meant to be a compliment or not! Jazz up a beige sofa with printed cushions and throws. They can easily be swapped about or moved from room to room if you get bored of the look. Artificial flowers will never wilt or fade, and they require zero maintenance – apart from an occasional dusting. Pop individual stems into jugs, bottles or jars for a country feel. A vibrant rug adds instant impact, breaking up floor space and helping to zone areas. Give drab walls a boost with fun artwork. If a big print is too much of a commitment, try hanging smaller plaques and frames using Command strips so they can be moved around without peeling off the paint. If coloured curtains are too heavy for your space, brighten windows with bunting or a fun garland. Steph has strung felt balls on fishing wire to adorn her patio doorway. BERRY RED When it comes to eclectic homewares, you never know what you’ll find here. From bright textiles to quirky accessories, there’s a wealth of choice that will give your abode an artisan feel. BOMBAY DUCK For lovers of kitchenalia, online boutique Bombay Duck is a mustvisit. Beautiful china tea sets in candy colours are impossible to resist, alongside darling cake stands and kitsch melamine designs from Rice DK. DEBENHAMS Matthew Williamson is known for his bold use of colour and eclectic designs, and his new Butterfly Home range for Debenhams doesn’t disappoint. Take a look at his tropical motifs and intricate patterns in holiday hues both in the shop and online. paper to the centres. Years later, I found the matching coffee table at an antiques centre and gave it the same treatment to make a complete set. shelves – although Command picture strips come in pretty handy, too! Treat a friend to a creative gift to keep them busy ’til New Year – or put one on your own wish list! Go along to London Craft Week between 9 and 13 May and discover a whole world of hidden workshops and makers. This annual event showcases the skills of independent craftspeople, plus the teams behind luxury brands such as Mulberry and Burberry. The week-long programme also offers you the opportunity to experience talks and workshops about a broad range of crafts. You can book tickets at londoncraftweek.com. It’s official, weaving is cool! It may go back as far as the Ancient Egyptians, but this technique is back in a whole new way, with high street giants and small suppliers getting on board with the trend. Try it yourself by picking up a starter kit that includes a basic loom, like this one from Wool Couture Company, £15, Etsy. Weaving is associated with mindfulness, too, so you can make gorgeous things while eliminating stress – win! If you’re looking for new ways to make, A Well Crafted Home by Janet Crowther (photographs by Julia Wade, £19.99, Clarkson Potter) offers an anthology of taster projects. Whether you fancy crafting something yourself from scratch or just want to give a preloved piece a quick revamp, choose from 60 inspiring projects, presented by room. There are plenty of techniques to try, too, from woodworking to simple sewing, or have fun with spray paint to make this ombre vase. f you’re fanatical about fabrics and find it tricky picking only a few for a project, you'll love this handy little bag as it sneakily hides an extra print in its clever inverted pleats. Simply choose three contrasting cottons and get pleating, then indulge a love of trims by combining bobbles and ribbon. It stitches up in a jiffy, too, making it an ideal gift for storing make-up, stationery, or even stitchy notions. Cut eight 7 x 18cm rectangles from fabric 2 and six from 3. Pin a light piece to a dark piece (a), right sides together. Sew a 1cm seam on one long edge and press open. Alternate three more dark and two light (b). Repeat to make a second patchwork piece. Lay one right side up and mark the centre of each light panel at the top and bottom with a chalk pencil. Fold the right-hand edge of the first dark panel to the mark on the first light piece and pin. Repeat on the left-hand side to create an inverted pleat. Do the same across both pieces, top and bottom (c) and hand sew to secure. rectangle right side down on top. Sew with a 1cm seam, then press open. Pin pink grosgrain ribbon along the join (d) and stitch down both long edges. Repeat for the other patchwork panel. For the lining, cut two 22 x 24cm rectangles from fabric 3. Lay one right side up with the zip on top, teeth side up, aligning the top edges. Place a patchwork outer right side down on top and pin. Stitch close to the teeth using a zipper foot. Press the fabrics away from the zip. Repeat to attach the other piece. Topstitch 3mm from the seam in coordinating thread. Open the zip slightly, then fold the fabrics so the lining and the outer panels are right sides together and pin. Sew a 1cm seam around the outside, leaving a 5cm gap in the lining. Tweak one corner of the lining so the seams are on top of one another. Stitch across 3cm from the point then snip 1cm from the stitches. Repeat for the other corners. Turn the bag out through the gap in the lining. Press the opening seam and slipstitch closed. Push the lining inside the bag. Make a ribbon bow and sew in place. ittle ones can lose themselves in an underwater world with our magical mermaid blanket. With its glistening tail, quilted outer and soft lining, it’ll be their favourite story time cosy-up. For an adult version, follow the pattern using your own measurements. Lay a tail piece right side up and place the waist fin wrong side down on top, aligning the top straight edges. Add a lining piece right side down, pin and stitch with a 1.5cm seam allowance (c). Trim the seam to 5mm. Sew the remaining quilted tail and lining right sides together, and press. Measure your child’s hips and divide by two. Add 16cm ease and 3cm seam allowance. Divide total by two. For the blanket length, get your child to lie on a flat surface and measure from their waist to the tips of their toes. Add 3cm seam allowance, 10cm ease. Draw a rectangle on pattern paper to these measurements. On the bottom edge, measure and mark 10cm along from the left-hand corner. From the top right-hand corner, draw a gradual curve down to the bottom mark. Cut out the tail. Place the straight edge on the fold of turquoise batik fabric, wadding and lining, and cut two of each. Press open a tail piece, right sides up. Open the other piece and place on top, right sides down, waist fin facing the outer tail. Pin around the edges (d) and sew from the bottom of the outer tail, around the lining and to the other bottom outer edge, leaving the narrow tail base open. Trim the seam allowance to 1cm all round and clip the curves. Carefully pull the quilted outer tail over the lining so it’s right sides out. Topstitch around the waist edge, 3mm from the seam (e). ‘tack the organza to the quilting cotton if it’s easier to sew’ blanket (a). Quilt in coordinating thread. Repeat for the other pieces. Trim 1cm from the wadding at the bottom edge. For the waist fins, measure 5cm down from the top left-hand corner of your pattern. Do the same 12cm down from the right-hand corner. Join the two points with a gradual curve. The narrowest straight edge is the fold line. Use the template to cut two each, on the fold, from turquoise and iridescent fabrics. Place a turquoise piece right side up, then an iridescent one right side up on top. Layer an iridescent then a turquoise piece, right sides down. Pin and stitch around the curves and sides only, using a 1cm seam allowance. Notch the curves and turn out (b). Press well. To make the tail fin, on a 31cm x 34cm sheet of paper, measure 26cm down from the top left-hand corner. Draw a curve from this mark to the bottom right-hand corner. Measure 9.5cm along from the top left-hand corner. Draw a curve to the bottom right-hand corner. The left-hand straight edge is the fold line. Place the tail pattern on the fold of turquoise and iridescent fabrics; cut two of each and one wadding. Layer the wadding with a turquoise and iridescent piece, right sides up, then iridescent and turquoise, right sides down. Sew around the curves using a 1cm seam allowance. Clip, trim the seams to 5mm and turn out. around the tail 2cm in from the 10 Quilt seam, then another 2cm in. Press 1.5cm under at the tail opening. Slide the tail in the gap, pin (f) and topstitch. diamond ribbon. Repeat to add a line of running stitch 5mm to the left of the 1.5cm pink ribbon (c). Sew on six beads at the centre of the floral motifs on the 4cm wide trim (d). he global interiors trend is still hotter than the Moroccan sun, so what better way to embrace the vibrancy of faraway lands than by stitching your own ethnic-inspired cushion? Scatter cushions are an easy way to instantly give a room new life. For this cover, we’ve combined geometric Ikat prints and linen with embellished ribbons and fringe trim, resulting in a riot of jewel-like colour and rich texture. ‘pick your trims in similar tones and balance with a contrasting thread’ and a piece of 1cm diamond braid, 1cm to the right of the fabric join. Measure 3cm in from the righthand raw edge of the linen fabric and stitch a length of 2cm wide purple ribbon down both sides. Leave a 5mm gap, and attach a 1.5cm wide piece of pink lozenge ribbon in the same way. Trim the overlapping ribbon ends level with the fabric and press the whole piece on the reverse with a warm iron. Lay the cushion front, right side up on a flat surface. Measure and mark a line 1cm in from each short edge. Place the tassel fringe on top, tassels facing inwards, and pin the weave of the trim where the tassels are joined at the line (f). Tack in place. Repeat at the other end. With the cushion front still facing up, place the rectangle with the trim right sides down on the left-hand side so that the pink panel is on the right and the raw edges are aligned. Next, place the linen rectangle on top, right side down, so the hem is on the left and raw edges are aligned. Pin around the edges, then sew with a 1cm seam allowance, catching the trim in the end seams. Turn it out through the envelope back and gently press. Cut 8 x 27cm of printed cotton and 11 x 27cm of linen. Pin and stitch together using a 1cm seam allowance, then press the seam towards the printed fabric. Sew a length of purple ribbon across the join. Turn a 1cm double hem along the short edge of the printed fabric, pin and sew in a coordinating thread (e). Cut 27 x 43cm of linen and hem one short edge in the same way. Trace off the template (below) then, using carbon paper, transfer the shapes on to cream felt. Secure in an embroidery hoop, if desired. the back of the stitched necklace and adhere to another piece of cream felt. Leave to dry. Cut around the shape. Once dry, work blanket stitch around the edge of the necklace using two strands of mint embroidery thread. Sew a jump ring to each top point of the felt. Thread 60cm of narrow ribbon through each jump ring and fold to make a double length. Tie a knot in the end and snip the ends into neat diagonal points. Add a little fabric glue to prevent fraying. HERE ARE SOME YOU CAN BUY IF YOU PREFER! colourful textiles and haberdashery in the many specialised stores. Borovick Fabrics, for example, has been famous since the Seventies for being the place to go for exotic fabrics, such as furs and sequins. Cloth House, meanwhile, offers splendid natural fibres and is a wonderful resource for beautiful sewing accessories and vintage haberdashery in an inspiring setting with timeless appeal. Other shops to visit include Misan Fabrics, The Silk Society and The Berwick Street Cloth Shop. WHERE? Shepherd s Bush WHY VISIT? Bargain buys Situated in West London, Goldhawk Road is home to over a dozen fabulous textile shops now that s a whole lot of yardage to peruse. If you can t find what you re after here, it probably doesn t exist! It s a great place for grabbing a deal, too, so don t forget to hunt around in the bargain bins for some leftover remnants for just a few pounds each. For a comprehensive guide to London s best sewing and knitting shops, pick up a copy of London Stitch And Knit by Leigh Metcalf (Black Dog, ÂŁ16.95). Trina, $14, victorypatterns.com Hot off the drafting table at Victory Patterns is this classic wrap dress with a Japanese flavour in its kimono-style sleeves. The cross-over bodice creates a flattering V-neckline with gathers above the bust line. There is also a second option in the form of a versatile wrap tunic. For a slinky show-stopper, make up the dress in silk charmeuse in a striking plain or bold print. Newbies might want to opt for a more stable fabric, such as voile or double gauze. The pattern is available as a pdf in sizes US 2-16. Vogue 8944, £12, sewdirect.com From well-renowned brand Vogue Patterns, style 8944 is a true classic. The colour block panels create an ultra-flattering style and are easy to personalise – why not create an on-trend ombre effect? The dress is lined, with a yoke front and back zipper, and has a neat narrow hem. It can be made up in sizes US 6-22, making it great for all figure types. For winter outings, try the sleeved option or stitch in ponte knits for a casual finish. If you’ve a more glam do in mind, try a printed crêpe instead. TOPSTITCHING This literally involves stitching on top of the seam, either for decoration or to add strength. Use contrasting topstitching thread or an all-purpose variety. You can also buy specific needles for the job – twin needles create a lovely hem detail. Avoid backstitching to keep the front of your project neat and keep stitching parallel to the seam – an edgestitch foot will help with this. ROULEAU CORD Rouleau straps or loops are very fine tubes of fabric that create a length of cord. They are often used with buttons instead of buttonholes but also make delicate straps. Start by cutting fabric on the bias and fold in half lengthways, right sides together. Stitch close to the fold. Trim close to the seam and turn out using a loop turner or bodkin. Press flat, or steam to keep the loop rounded. The latest pattern from sewing goddess, Lisa Comfort, the Rosie dress has everything we’ve come to expect from Sew Over It patterns. Flirty, feminine and with a vintage feel, Rosie is the ultimate party dress, complete with a fitted bodice and full skirt. There are three versions to choose from, too: the first has a retro collar and wide straps, while the second has a pretty sweetheart neckline and dainty rouleau straps. Option three is a versatile skirt taking you through all the seasons – stitch it in printed cotton for summer or cosy wool crêpe for winter. The pattern is available as a printed or pdf version in UK sizes 8-20. Only got a few hours to stitch your dream party dress? Enter Catarina. It takes just two hours to construct this midi-length marvel, which features a gathered skirt and elasticated waist, combined with a figure-skimming top. The pattern is pdf only and can be made in US sizes 0-26. Catarina is stunning in silk charmeuse, or try rayon for a more dressed down look. GATHERING This is a simple way to make a circle skirt fit a bodice. Divide the skirt top into sections and machine two or three rows of long tacking stitches. Leave the thread tails long and pull up the bobbin thread to gather, making sure they’re even before pinning and sewing. AT AN EXCLUSIVE SEWING SESSION AT SINGERâ&#x20AC;&#x2122;S LONDON HQ, DEPUTY EDITOR STEPH AND EDITOR LORRAINE TALK TO THE TAILORING ENTREPRENEUR ABOUT BUSINESS, THE BEE AND BISCUITS! LORRAINE AND STEPH – THE NEW MAY AND CLAUDIA, PERHAPS? Several months later, the winning stitchers had been informed, and we were delighted to head to Singer HQ in London to meet one of the fortunate groups. When we arrived, the ladies were already at work and appearing surprisingly calm – not at all like the frantic buzz of the Sewing Bee workroom. This was a casual session, with the individuals bringing a garment to customise or refashion under the expertise of Mr Grant and two helpful seamstresses. “It’s not a competition, just relax and have fun,” reassured the Sewing Bee judge, who was dressed in a slightly crumpled shirt and turned up chinos from his bike ride in. Of course, we are more familiar with his trademark sharp suit and trousers, but ‘oﬀ duty’ there’s no sign of media fame and adoration going to his head. Patrick is perfectly at home circulating round the room chatting to the excited sewers and talking candidly about the Bee and other projects. people,” Patrick explained. “Alex was great, but she wouldn’t stop chatting! Claudia is brilliant at pepping up the contestants, although when Tamara got the glue gun out in the series two final, she ran back with her head in her hands!” So, do the contestants really have the set time to complete their challenges? “Absolutely!” Patrick assured the group. “It’s the BBC! They’re total sticklers for time. If they have three hours, they have exactly three hours, and if they’re allowed extra time, the viewers are told. However, in the made to measure challenges, the model’s measurements are given in advance to allow the stitchers time to adapt the pattern.” So that clears that one up! When Sew was invited to an exclusive workshop at Singer head quarters, hosted by Sewing Bee judge and master of tailoring, Patrick Grant, I cleared my diary SERIES FOUR Several hours, and a number of Bourbon the very same day! Owner of Savile biscuits – Patrick’s favourites – later, the ladies Row tailors, Norton & Sons, and at were given their 10 minute warning. Keeping their cool more than many previous Sewing Bee least two other fashion brands, the finalists, the last hems were sewn and buttons handsome 6ft-something is a tricky attached, and the winners gathered excitedly PATRICK ON THE CONTESTANTS man to track down, so this was not “When Neil was winning all the challenges for the judging to begin. One by one the ladies leading up to the final of this year’s Sewing Bee, placed their garments on a mannequin, while an opportunity to be missed. the fastidious master tailor provided kind and encouraging words, alongside constructive feedback for improvement. 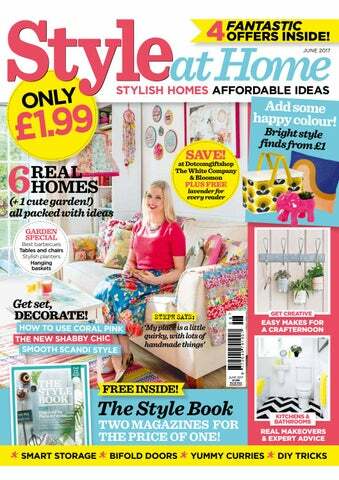 During the last series of the Sewing Bee, if we weren’t glued to our TV screens, we were rushing out in our thousands to buy stitching supplies, with many of us treating ourselves to a sparkly new sewing machine. Leading brand, Singer, oﬀered the ultimate incentive, hosting a competition for Singer sewing machine purchasers to win a prestigious sewing session with Patrick himself. HOW DID YOU GET INVOLVED IN THE SEWING BEE? I was put forward by now former BBC commissioner Emma Willis, who had produced several documentaries I’d been involved in. WERE THERE OTHERS IN THE RUNNING TO BECOME JUDGES? I was invited to take part in several screen tests with four diﬀerent ladies and one bloke. I can’t tell you who, though! HAVE YOU EVER COMPLETED A SEWING BEE CHALLENGE? They’ve never actually made me do a task yet! WILL THERE EVER BE A KIDS’ VERSION? It’d be great, but the rules around kids on TV are super strict. DO YOU EVER GET TO SEW YOUR OWN CLOTHES? Not very often! The last thing I stitched was a pair of trousers I customised for an ’80s fancy dress party. Naturally, we couldn’t resist getting the scoop on series four. “I haven’t seen the finalised cast,” Patrick admitted. “It’s a long process! I’ve only seen the sewing tests, where around 50 people take part in a timed, filmed task to see how they cope under pressure. They have to be able to stay calm in front of the cameras. When filming begins and the contestants first walk into the sewing room, they are visibly nervous, but by the second week people have largely forgotten about them.” So when should we clear our diaries for the next series? Unfortunately Patrick and Love Productions are unable to confirm just yet, but we’re predicting spring 2016, so watch this space! glancing surreptitiously in recognition of the TV personality. It’s impossible not to be compelled by his charisma, as he casually speaks of his fortunate upbringing and career in a way that makes it sound wonderfully everyday; from racing to the canteen of his Durham boarding school to ensure he got the best biscuits, to his time with The Prince of Wales and other wealthy investors supporting a programme of sewing courses at Dumfries House. As the afternoon sewing session was scheduled to begin, Patrick was summoned back to his duties. Wearing a homemade skirt myself, I couldn’t help but take the opportunity and tentatively request an auspicious critique of my own. “I thought you’d made it, it’s very good,” he reassured me. I’m not completely convinced, but at least next series, when some poor soul is under jurisdiction for an uneven hem or wonky zip, I can revel in my positive feedback from the infamous male Sewing Bee judge! THE EDINBURGH BORN JUDGE STUDIED ENGINEERING AT LEEDS AND HAS AN MBA FROM SAID BUSINESS SCHOOL IN OXFORD. Corsets or ‘stays’ become popular as an undergarment in Europe. The use of metal eyelets means that tighter lacing is possible. Occasional periodicals are printed aimed at women containing corset patterns and fashion advice. Steel split-metal busk fastenings are invented. The Rational Dress Society is formed in London, promoting less restrictive corsetry for women. Whale boning became less plentiful and better quality steel is available. Dior’s small-waisted ‘New Style’ sees the return of less extreme corsetry. More emphasis on decoration including fine fabrics and embroidery. Tight lacing becomes fashionable again and physicians release a warning about the harmful effects. The boyish, waist-less fashion means corsetry is swapped for girdles and bras. Madonna and fashion designer Jean Paul Gaultier bring corsets back in fashion. t Homemaker we love nothing more then seeing something ordinary transformed into something beautiful, so imagine our excitement at the possibilities Christmas brings for getting all creative with the bits and bobs we’ve hoarded over the past 12 months. It’s time to raid the cupboards in search of the potential which lies within everyday finds. You might be surprised at what lovely things arise once you get to work with just a few store-cupboard materials and a little imagination! We certainly were when Kate Nicole presented us with their floating star garlands created from pages of a magazine, not to mention Jacqueline Tinney’s coordinating card and tag designs made using red and green paint sample strips. These simple ideas are perfect for preparing lots of cards and gifts at once, as they’re easy to recreate and don’t cost the earth. What’s more, they’ll give your gifts a homespun feel that’s personal to you and friends will love. Using the template provided online or a paper punch, cut out 12 scalloped paper circles from a magazine, newspaper or old book pages. Pile the paper circles on top of the other and find the centre point. Using a craft knife, make a small slit through all the layers. Insert a split pin and open it out at the back to secure the layers together. Crumple and squash each layer in turn towards the centre. When all the sections are done, run your hands over the flower to open it out again. Cut a star stencil out of stiff card. Select your paper and layer a few sheets together, making sure you are still able to cut through cleanly. Place your stencil on top, draw around and cut out. Repeat until you have approximately 30 shapes. Prepare your sewing machine with a festive thread. You will need to use a flat foot, so the shapes run through without puckering. Place a star under the foot and sew slowly, making sure the machine is running smoothly through the paper. Continue to stitch the stars, leaving a small gap between each one. Once you have sewn all the stars, cut two 20cm lengths of ribbon. Fold in half so that the ends are laying flat on the first and last motif, then sew the tabs into place. Stick strips of red and green washi tape to a rectangle of brown card (from recycled packaging), then cut out simple Christmas tree shapes so that the washi tape strips runs horizontally. Glue the tree shapes onto the front of white card blanks and print or stamp a Christmas greeting below the motif. Secrets to a perfectly wrapped gift... Take heed of these top tips for professional parcels every time •Don’t leave wrapping until the last minute. Wrap gifts as you go, but leave the embellishments until later. Keep track of whose gift is whose by popping on sticky notes. •Select a colour scheme for all your wrapping materials so that the gifts you give will have your signature. •When it comes to wrapping gifts like a pro, double-sided tape is an absolute must as it sticks well and stays hidden. •Arm yourself with other essential tools including a rotary cutter for quick, even cuts, a sturdy ruler and a self-healing cutting mat. •When wrapping boxes, be careful not to use too much paper as it leads to bulky, unattractive folds.